Last week I wrote about our outing to harvest ramps (or more properly, bear garlic). 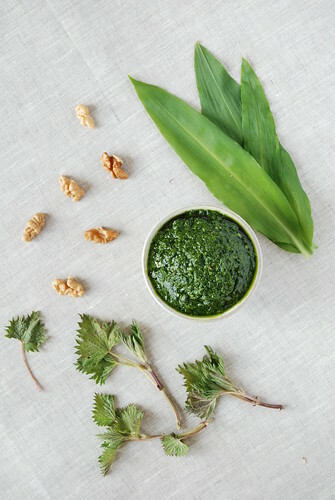 There is another wild vegetable available early in the spring: stinging nettle. Stinging nettle has a distinctive sting when you touch it, but boiling or drying the plant negates the sting. It is a powerhouse of nutrients, packing many healthy benefits. A very shortened list includes the facts that: it is high in vitamin A, K, calcium, manganese, and magnesium; it supports the adrenals, kidney, and lymph system; is anti-inflammatory; increases milk supply for lactating women. In short, it’s sure to promote your health and well-being. It can also be used to fertilize garden soil and fed to animals. But my favourite use is to make pesto with it. It’s oh-my-eat-it-with-a-spoon delicious. 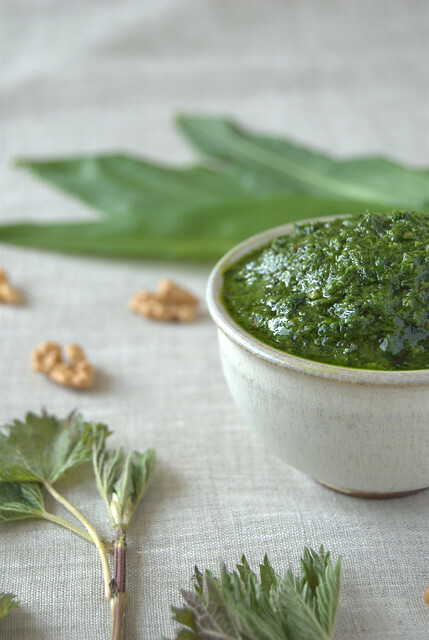 You can use pesto on pasta, in sandwiches and burgers, pizza or mini vegetable-pizza, in salad dressings, in soups or sauces, or, of course, by itself. 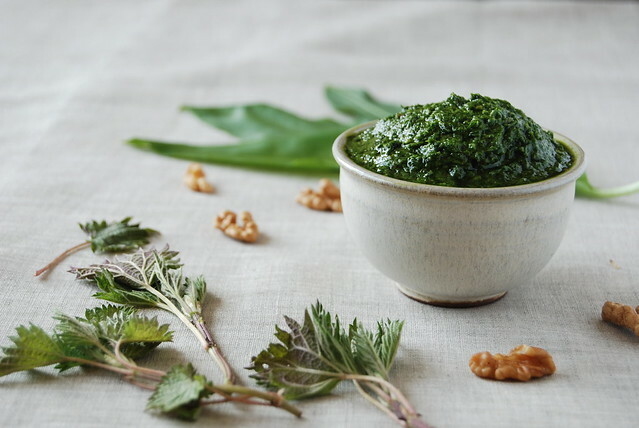 I’ve included ramps in this amazingly delicious but health supporting pesto, but if you don’t have them just substitute with garlic cloves. In the past I’ve used classic Parmesan, but also bryndza (a soft Slovak sheep cheese) and feta. Use your imagination! This time I made it dairy free with nutritional yeast, and to be honest I don’t miss the cheese. If you can’t eat nuts (allergic, AIP, etc), they can be easily left out. Blanch the nettles in boiling water for 30 seconds to one minute (you can rinse the nettles off beforehand if you wish, but I’m rather lazy and take my chances). Drain and rinse with cold water. Squeeze the water out of the nettles (you’ll be left with maybe 1/2 cup). This entry was posted in Food and tagged AIP, dairy free, egg free, foraging, GAPS, gluten free, grain free, nut free, paleo, spreads & dips, spring, vegetarian. Bookmark the permalink.